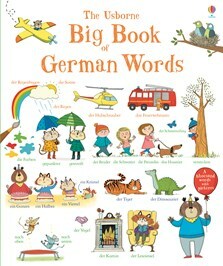 A wonderful collection of over 1000 words and pictures to help young German learners build their vocabulary. Each page has useful everyday words matched with a detailed picture to aid language learning and comprehension. Words are grouped by page into subjects such as “home and garden”, “family”, “transport”, actions” and lots more. With a bilingual word list at the back of the book and links to listen to all the words pronounced by a native speaker at the Usborne Quicklinks website.